Help! Too many cookies! I need a salad stat! Unfortunately there are no salads to talk about in the near future because if I don’t share a couple more treats it’ll be next year before I get them to you. As you can tell, I’m a bit behind. A way bit behind and I might be sharing holiday recipes until mid January. (You think I’m kidding don’t you?) Tis the season though and that has to be ok. Besides, I’m counting on you to be a bit behind too so I can feel better about my failure as a human to get my thousand item list accomplished. I hope you’ll forgive another cookie recipe. This one I shared a year or so ago with a few MySpace friends (most of us are long gone from poor old MySpace now). Spastically, when I deleted the account I lost many of those recipes I’d shared. Though lucky for me, my friend Marina was on the ball and was able to give me back a copy of this one. I’m so glad to have organized friends. Now if only they could get me organized! 2. Heat oven to 350°F. Lightly grease cookie sheet. Shape dough into 1-inch balls. Place on prepared cookie sheet. Press thumb gently in center of each cookie. 3. Bake 9 to 11 minutes or until set. Remove wrappers from chocolate pieces. Remove cookies from cookie sheet to wire rack; cool 3 to 5 minutes. Gently press chocolate piece in center of each cookie. Cool completely. 4. Warm mint drizzle as directed if needed and zigzag over cookies. Let set and enjoy. Recipe adapted from Hershey.com. Photograph by Laura Flowers. Girl you are forgiven for anything with mint and chocolate. I hear ya with being behind. I ordered 20 Christmas cards and I wouldn't have enough time to order more so the rest got an email with the card photo and a note. I figure it's the thought that counts (hopefully). Plenty of time for salads next year! This is a great cookie recipe! Seriously, this is a really nice holiday cookie. These are the most perfectly shaped ones I have seen! Lovely. Can you ever have too many cookies? :) And those are so cute! They sound delicious too, I am so glad your friend saved the recipe for you to share. This will definitely be going on my Christmas baking list, thank you for sharing! ooh - those little chocolatey heaps of pleasure look divine. Funny how Santa is always on schedule ! If it makes you feel any better, I'm only sharing my first Christmas cookie recipe TOMORROW. As in the day before christmas eve. Talk about behind! It's a good thing I stocked up on mint truffle kisses a few days ago! I will in fact be making these in January. So take your time. I'm way behind as well. :) I'm making cookies tomorrow after I do my Christmas shopping. These look yummy! These look delicious!! 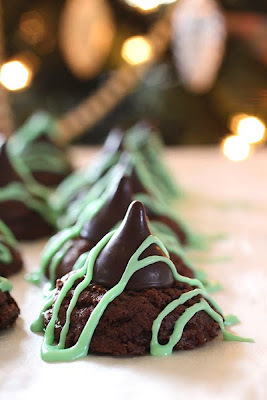 I love the combination of mint and chocolate. Orange and chocolate is a new one for me too, and I love that as well. Your cookie sort of reminds me of a mini Christmas tree! I bet it's tasty! thosoe look great!!! i'm sending u the recipe for the TWD cardamom crumb cake. You can never have too many cookie recipes in my opinion. Love these, they look so fancy and tasty too, of course! I will have to look for the green stuff at Michael's. What pretty drizzling and I love the lights in the background. These look like the perfect little sweet bites for Christmas. Beautiful job! I love these and will enjoy making them. I searched your blog this year and found 3 recipes that I tried for Christmas. this was one of them. I was really excited about these and these replaced the peanut butter blossoms that my family loves. I was a bit disappointed in these and don't think I'll be making them again. Maybe it was just too much chocolate for me?